The Isle of Mull is a car ferry operating between Oban, Scotland, U.K. and Craignure on Inner Hebrides island. The Isle of Mull is operated by Caledonian MacBrayne. This picture was sent in by KW. He writes: "[This vessel] was built in 1988 at Port Glasgow on the Clyde, and was designed to accommodate up to 80 cars and up to 972 passengers. 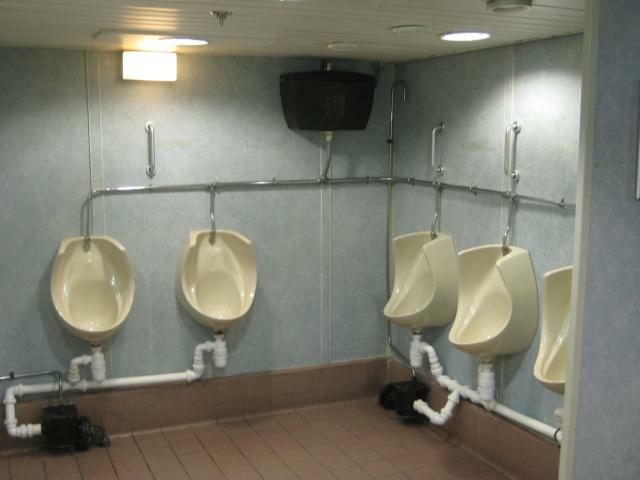 Handles above the urinals help stabilize passengers using them in stormy weather."